Lighting Scaffolding is a kind of Steel Scaffolding, or Ringlock Scaffolding. Due to its heavy duty capacity, it is usually used in massive truss constructions! It is steel with zinc galvanized, and it can be installed more than 20m high and more than 100m width, as massive as you can image!. 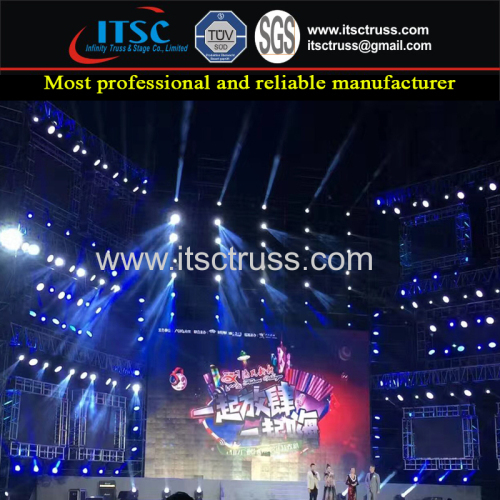 So it usually applied with Lighting Trusses as well in Big Concerts, or Large Events. Calculate the weight and volume for clearance documents: packing list, invoice, B/L, ect. 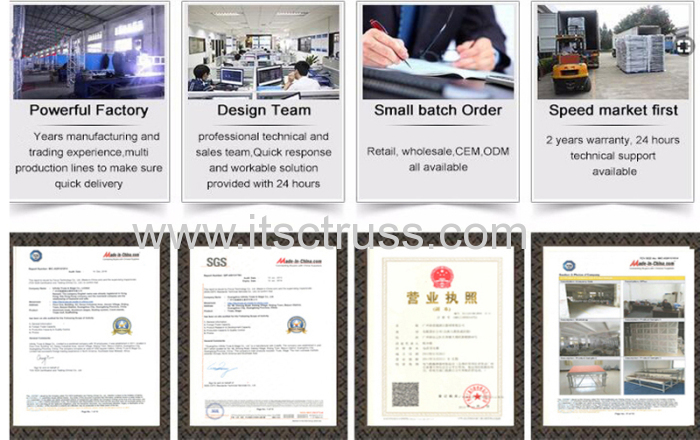 And other special documents for clearance in different countries. Arrange container and load and ready to delivery. Usually takes 12-45days depending on different areas. Plan to visi ITSC truss group? We will service you soul and heart during your whole visit, picking up from airport,taking good care of your luggage,preparing all the items you are interested,or even be your translator if you need our heolp for free! 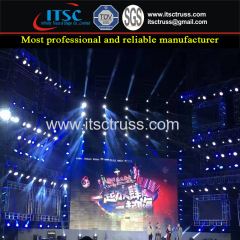 ‍This Concert Event Aluminum truss rigging is widely used for concerts,shows, performance. 1. Feature: Compactness, strength, versatility, low unit weight large span and heavy duty capacity. 2. Usage: Hang acoustics, speaker, stage lighting, LED screen and so on. 3. Features: Truss with high welding technology and good quality of aluminum tube. It takes 3-5 hours to set up with the electronic hoist and chain. 1. Clean, check and maintain your trusses on a regular basis. 2. Throw away the damaged or deformed trusses, spigot pins or couplers. 3. Make a structural calculation for each construction you build. 4. Store and transport your trusses on proper dolly. 5. Attach loads in node points. 6. Check how loads are attached to the trusses before lifting. 1. Mix trusses rigging of multiple suppliers in one construction, unless specifically stated by manufacturer. 2. Exceed the maximum loading of single spans as specified in the loading tables. 3. Exceed the given structural data of trusses. 4. Drill holes in the trusses tubes. 5. Use damaged trusses rigging, couplers and spigot pins. 6. Attach loads to the truss diagonals. 1. With a self-weight ca. 65% les than steel. 2. It is corrosion resistant and requires less maintenance and no corrosion protection. 3. With a relatively high tensile strength. 4. With attractive appearance due to its natural lustre. 1. Q: What certificate do ITSC Truss have? A: SGS, and TUV certification and business license. 2. Q: What are the terms of payment? A: Bank Transfer, Western Union By T/T, 30% of invoice value as deposit, 70% balance paid before shipping and some others. 3. Q: Where is the loading port? A: Port Huangpu in Guangzhou or Ports in Shenzhen. A: We control products quality under the instruction of ISO90000. 5. Q: What is your packaging? A: Air bubble film or Carton or fly case. 6. Q: When will you deliver the goods?